In the Custom Class, racing twice round a 600m course with buoys to negotiate, against the previous CCC champions who have designed and built their own sleek racing machines with no limits on the number or power of the cordless tools driving them. 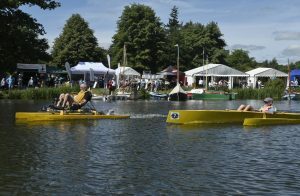 In the Cordless Blue Riband, the challengers race not against each other but against the clock, to beat the World Speed Record for Cordless Canoes, set last year by Dennis Adcock in his little 8′ (2.4m) cat propelled by two Makita 18 volt brushless drills – pictured above – at an astonishing 10.32mph! CAN YOU BEAT OUR WORLD RECORD? For the full CCC 2018 rules, see the November/December issue of Water Craft or go to: www.watercraft-magazine.com where you’ll also find videos of our previous CCC tournaments.